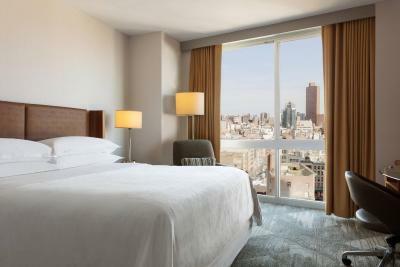 Lock in a great price for Sheraton Tribeca New York Hotel – rated 8.1 by recent guests! Fantastic room, bit on small size but was ideal for us. Very clean. Brilliant staff. Excellent location. Nice stay. Comfy pillows. Updated room. LOVED the selfie station. What fun! The location is great! It is very close to Soho. The staff are friendly and helpful. I would definitely stay again in the future. 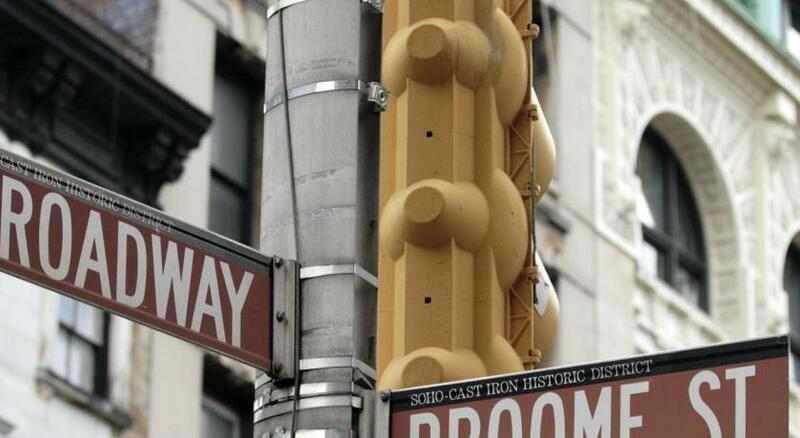 Good proximity to Soho and Tribeca. Rates were reasonable compared to alternatives. 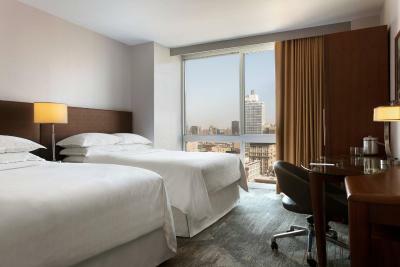 Sheraton Tribeca New York Hotel This rating is a reflection of how the property compares to the industry standard when it comes to price, facilities and services available. It's based on a self-evaluation by the property. Use this rating to help choose your stay! 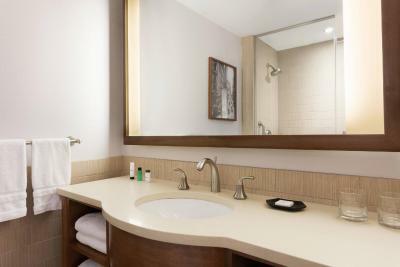 Sheraton Tribeca New York Hotel features a 32-inch flat-screen TV and a work desk in every guest room. 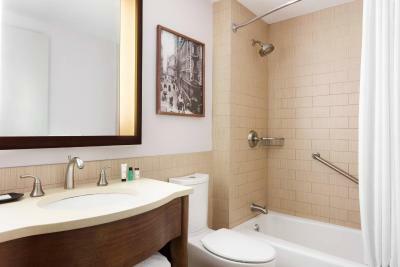 Select rooms offer views of Midtown and the Hudson River. The modern business center at the Tribeca Sheraton Hotel New York provides computer workstations, free WiFi and printing service. Antica Ristorante serves Italian cuisine, including fresh pasta and homemade dessert. 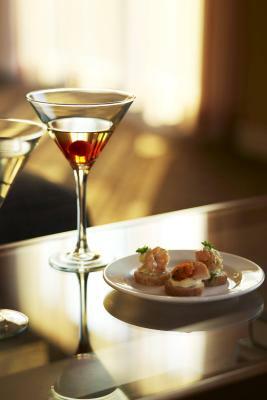 Guests can enjoy a glass of wine or cocktail at the Lobby Lounge or coffee from the on-site Starbucks. The Canal Street subway station is less than 1 block from the hotel. 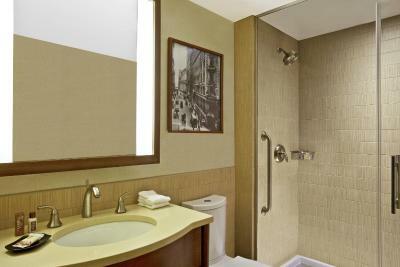 Sheraton Tribeca New York Hotel is a half mile from the Holland Tunnel and 1 miles from Greenwich Village. 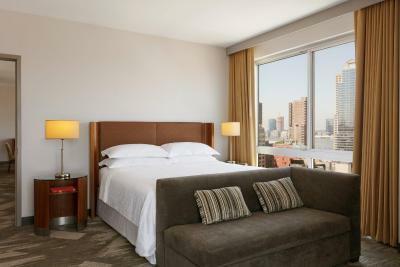 When would you like to stay at Sheraton Tribeca New York Hotel? Room includes a flat-screen TV, a work desk, a hairdryer and tea and coffee-making facilities. 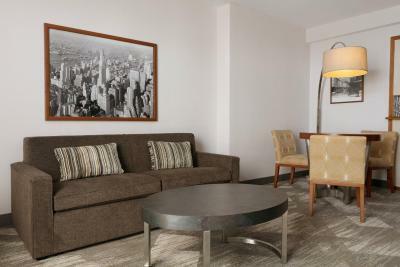 This club room is located on the higher floors of the hotel. It features access to the club lounge which features daily continental breakfast, evening hors d'oeuvres, a business center, free WiFi and access to a terrace (seasonal). 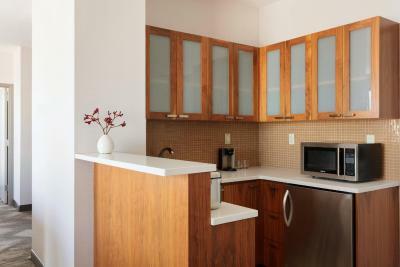 This room, with a city view, features a coffee machine and flat-screen cable TV. This room features a coffee machine, flat-screen cable TV and a sofa bed. This room features a coffee machine, flat-screen cable TV and a patio. 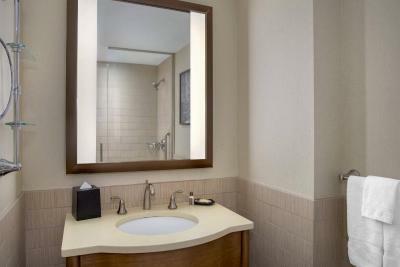 Suite includes a flat-screen TV, a work desk, a hairdryer and tea and coffee-making facilities. 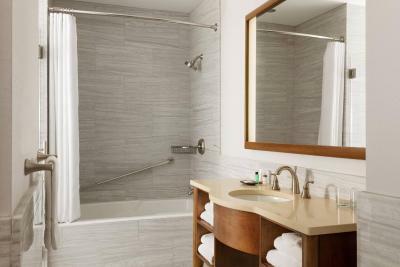 This suite has a executive lounge access, iPod dock and bathrobe. 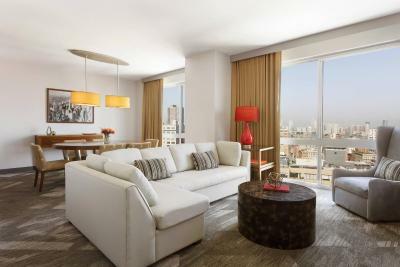 This suite is located on the higher floors of the hotel. It features access to the club lounge which features daily continental breakfast, evening hors d'oeuvres, a business center, free WiFi and access to a terrace (seasonal). 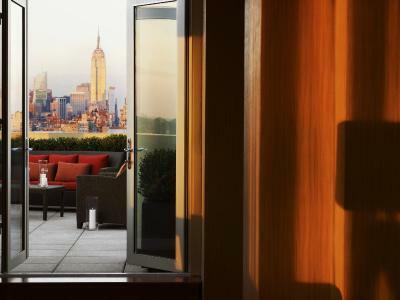 House Rules Sheraton Tribeca New York Hotel takes special requests – add in the next step! 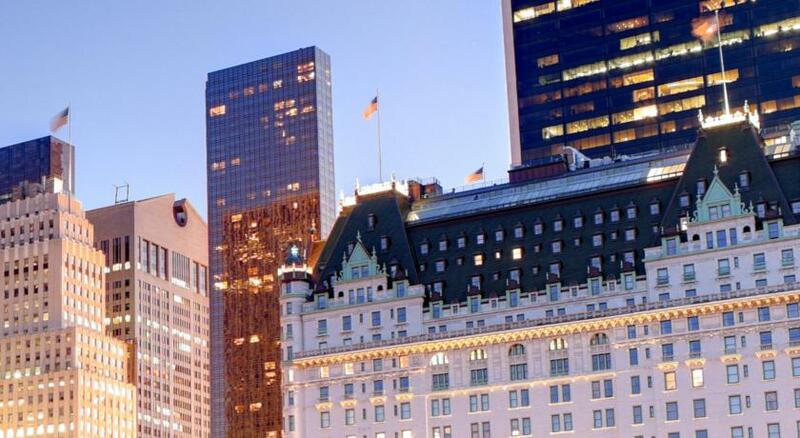 Sheraton Tribeca New York Hotel accepts these cards and reserves the right to temporarily hold an amount prior to arrival. Please note guests must be at least 21 years or older to check in. Please note: "Breakfast Included" rates include breakfast for 2 people only. Charges apply for additional guests. The hotel will accept up to 5 packages per room, at a max weight of 20 lbs. Additional charges apply for weight or packages more than that. Packages will be accepted a maximum of 7 days before the date of arrival. The bed was extremely comfy and the stuff very friendly and helpful! 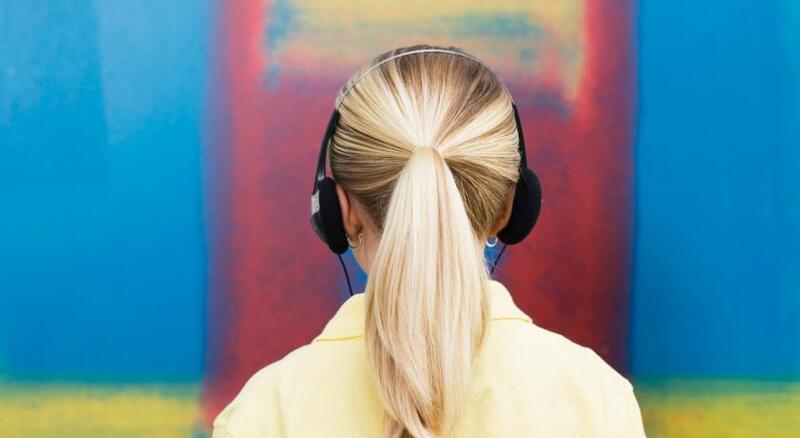 Rooms with a connecting door were not soundproof at all. The bed and pillows were comfortable at first, but WAY too soft. After a few days we both had back pain from it. It would be better to have options for the pillows that aren't dawn. We were also disappointed that the rooftop terrace was for club members only, not just the VIP part with snacks etc - seems like a waste, as it was completely empty when we tried to go look at the view. 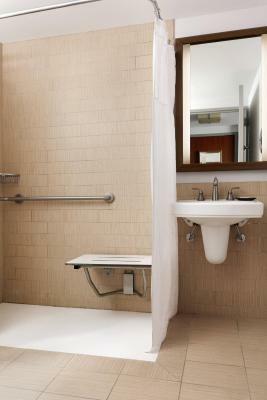 Location was great, right next to a subway station, very close to both central Manhattan and Brooklyn. Staff was very nice, especially the mail/luggage guys - sorry I forgot their names, but they were great. Can't comment on breakfast/restaurant, but there are several good options around the hotel. Looking at a view of a brick wall. seems to be not the best neighborhood, some homeless people hanging around in the area. breakfast was not bad, but limited choice (but seems to be normal in the US compared to what we are used to in EU). Could hear everything going on around us all night long. Sheets had a few stains- definitely need to throw out and replenish with new. Main lobby had very little comfy seating due to limited space available, mostly taken by reception and bar/restaurant. 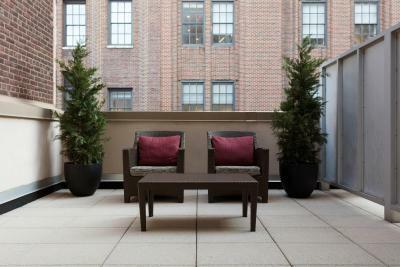 An area to chill while your room is being serviced for example would be a bonus. Although traffic noise was muted due to our height above street level, we could clearly hear the guests next door, which was a pain in the middle of the night. Our room was for a couple but only one bottle of water was provided each day. 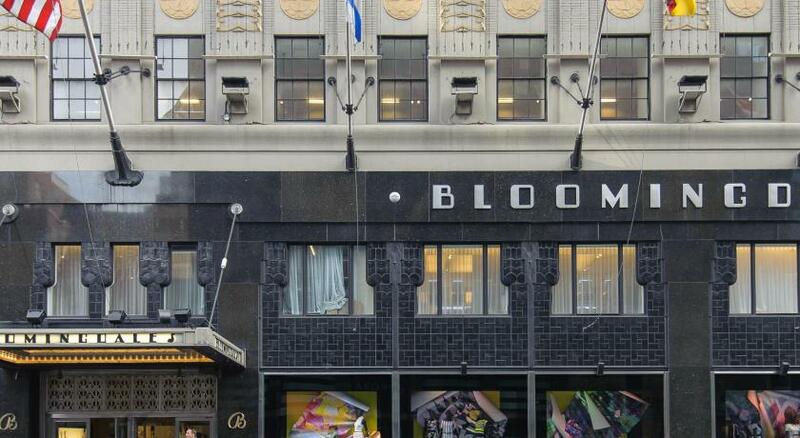 Location superb for amenities and shopping plus access to subway and bus networks. Our room was serviced to a high standard daily. The three lifts from reception made access so easy. A safe for valuables was provided in the room. Baggage storage was available at the hotel on checkout, which was great as we had a night time flight. An iron and ironing board also in room. Plenty hot water and a shower so powerful it felt like a massage. Had breakfast in the club-area. Fantastic view! Friendly and helpful staff and good facilities. The location is perfect for us. Good shops and restaurants nearby. We have stayed at the hotel before and will absolutely come again!